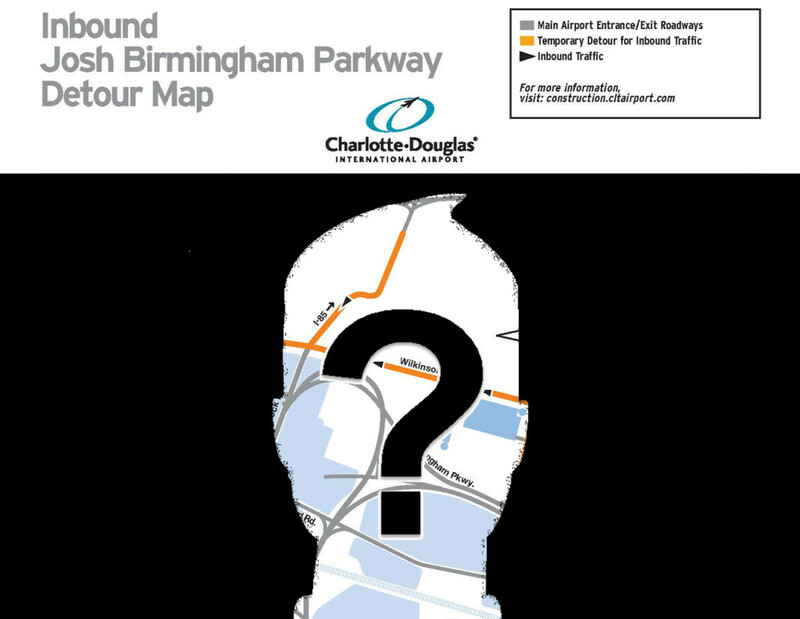 We caught up with Creative Director Amanda Fisher and Chief Cartographer Paul Bright to see what drives this Charlotte-based duo to produce print maps in a digital world. How did you get your start making maps? Paul has a background in cartography and does GIS work, so map-making is something he already does, but in a more technical way. I have always been a serious trip planner – really digging deep to find hole-in-the-wall stops and places that the locals frequent. Friends will often get in touch when they’re traveling and ask for recommendations, because they know I have lists and research already compiled. Making some sortof travel guide was a natural fit for us both. Maps were the way to go, because we’re both collectors and use them frequently. 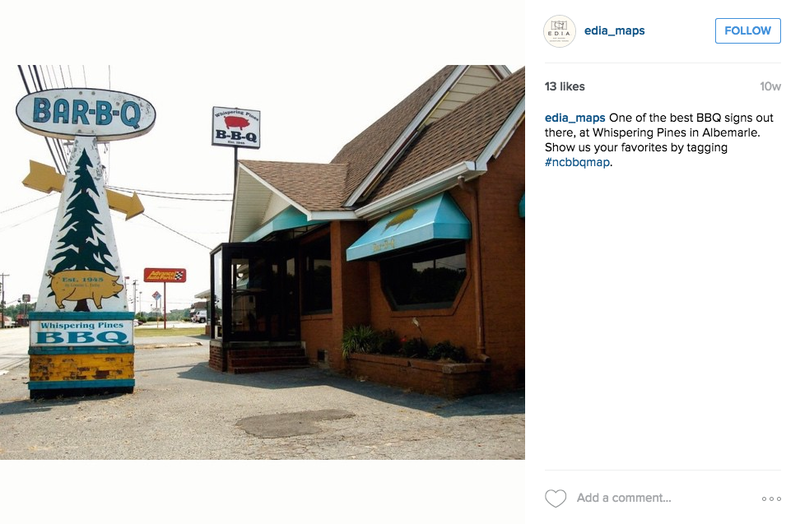 We chose BBQ for our first map because we love it and it’s our state’s most beloved food tradition. Beyond that, BBQ restaurants epitomize the town they’re in, and BBQ is its own subculture. That has always been the biggest thing that has drawn us to it during our own road trips. The philosophy behind EDIA is to take something everyday and turn it into an adventure, and I think we absolutely did that with our BBQ map. Plus no one had yet uncovered all the BBQ restaurants in North Carolina or taken the time to find out exactly how each of them prepared their BBQ. It was a map that was missing and just begging to be done. 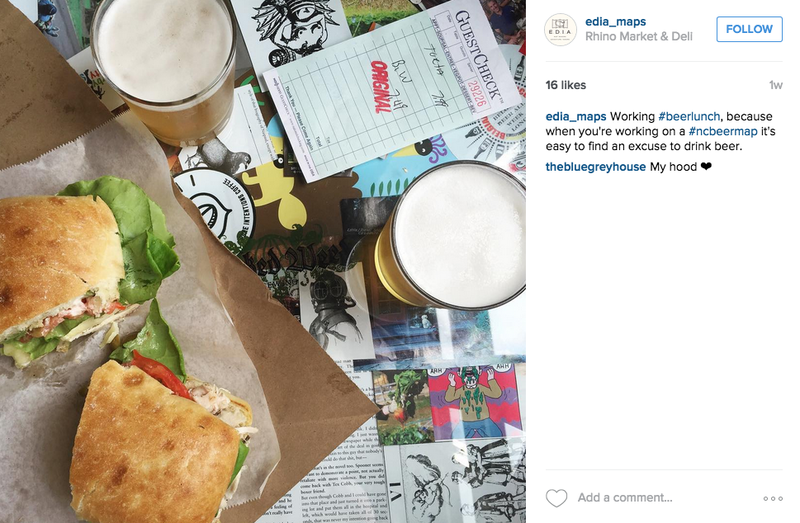 Why make print maps in a digital world? Maps are a great way to condense a ton of information down into a double-sided page and present it in a really cool way, visually. And the maps we make aren’t just points along the road. Aside from symbols that inforgraphically tell you a lot about each stop, each map is surrounded with graphics and details on the history and culture of the topic. We take you pretty deep into the subject matter to give some perspective to your travels. But the biggest difference between print and digital is the physicality and the connection to a tangible object. You can’t hang a phone app or website on your wall and stick pins in it to mark all the places you’ve visited. You can stand in front of a map and look and remember and plan and dream. 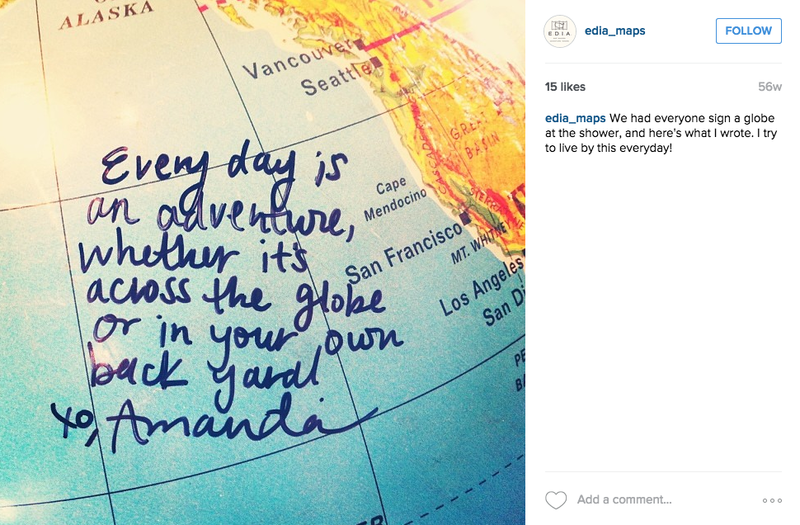 Our maps also create a sense of community, something we had never imagined before making them. We live in a world that oftentimes feels so detached, and maps are visible things you hold in your hands that someone sees, and it sparks a conversation over a commonality. People want to know where you’re going and where you’ve been and what you thought of it. Maps aren’t just guides; they’re memorabilia too – beautiful trip mementos that become part of your home and take you back to an adventure you had or a wonderful time making memories with people you love. They touch something deep within – a nostalgia and a wanderlust. What goes into producing one of your NC guide maps? It looks like you do the research and then partner with designers and printers. Tell us about the whole end-to-end production process with the full team. The research component is, by far, the most time consuming. The BBQ map took over a year to research. Once we pick a map to create, we go pretty far down the rabbit hole learning as much as we possibly can about that topic. The more we know, the better we can synthesize it and make something really fresh and new from that information. On top of that, we’re finding all the map points to be included and gathering the info for each of those places. For our first two maps, that’s when we got to talk to all the BBQ restaurant owners and brewery owners and really learn about what they do, which was a fun process. Paul handles the mapping, which includes everything from plotting each of the points to hand-selecting each road and town that should be included. I sketch out the other map components, and we both organize all the data. By the end, we have a huge packet to be mailed off to our designers and a list of files they get via email. For the design and print work, it’s very important to us to work with people who are also tied to the place and the subject matter. For the North Carolina maps, we have been working with another duo out of Raleigh, Good South, for our graphic design. They are as obsessed with BBQ, beer, and North Carolina food culture as we are, and they have that retro-modern aesthetic that is exactly what we are looking for. The design work usually takes about four to six weeks, and we go back and forth looking at design work and making tweaks until everything is just right. For printing, we work with Meredith-Webb in Burlington. They have many years of map printing experience and do everything in-house, from cutting down the paper to mixing the ink to printing and then folding the maps. 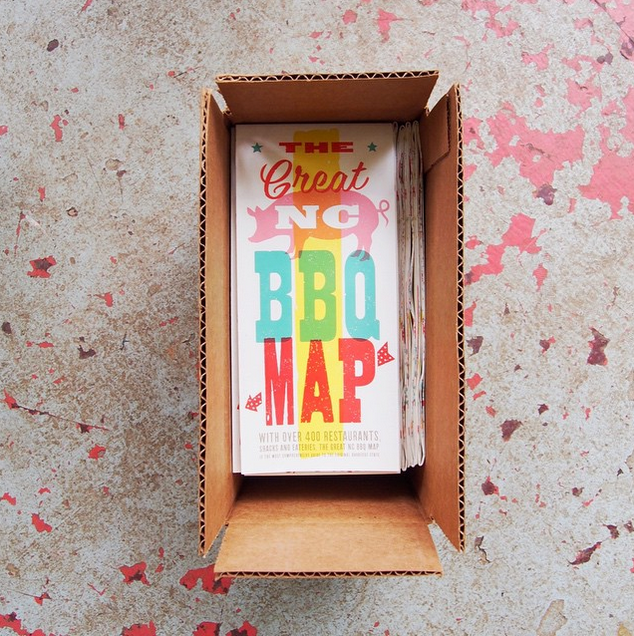 They were super excited to be the ones to print the BBQ map, because they’re all from North Carolina and have eaten BBQ all their lives. 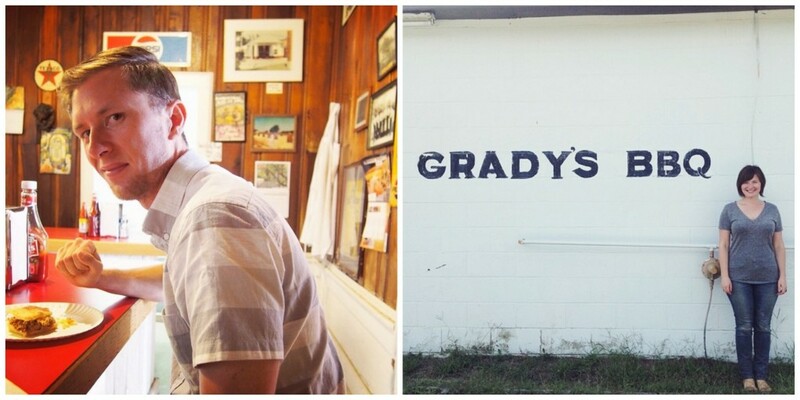 When we went for a tour, we all stood around talking about our favorite BBQ joints, the merits of Eastern versus Piedmont, and who had BBQ at their wedding and which restaurant catered it. I have no doubt they’ll be just as excited about printing The Great NC Beer Map. Eventually, we do plan to make maps of other states. We’ll always put together a team who lives and breathes the subject matter as much as we do. There are many hands that have to touch each map and add their piece. We want that to come from a deep place of authenticity, so that it really adds another layer of meaning to each project. Your company is all about turning every day into an adventure. Do any particular adventures stand out from the production of the BBQ or beer map? I think a lot of adventures inspired the concepts for these maps. A few years ago, we put together a Charlotte area BBQ and brewery tour for a big group of our friends. 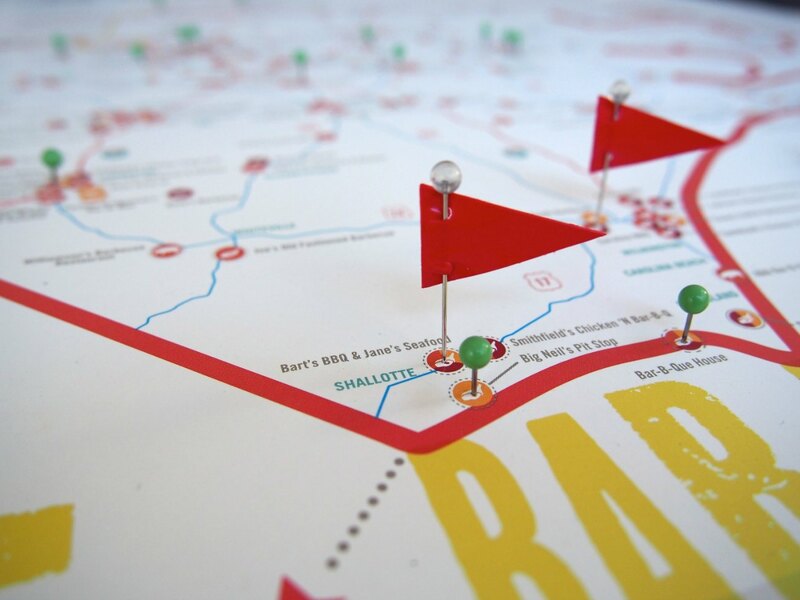 Considering we now have a BBQ map and a brewery map, I think that says a lot! We rented a van for the day, had a DD, and we hit five BBQ restaurants (starting with BBQ for breakfast at10:30AM) and three breweries. It was a 12 hour day of adventure, and some friends even managed to eat 5 BBQ sandwiches by themselves (which we don’t recommend – please share!) Between stops, we played oral histories from different BBQ joints that were created by the Southern Foodways Alliance. We had BBQ and beer trivia with prizes, goodie bags, and handmade pig noses. It was such a fun day, and it’s just the thing we hope people will do with our maps! What’s your favorite place to visit in NC? We like to go beyond the obvious places and love tiny town adventures. Off the top of my head, I’d throw out Ayden for beautiful drives and whole hog BBQ with cracklings mixed in. Also if you start in our hometown of Mt. 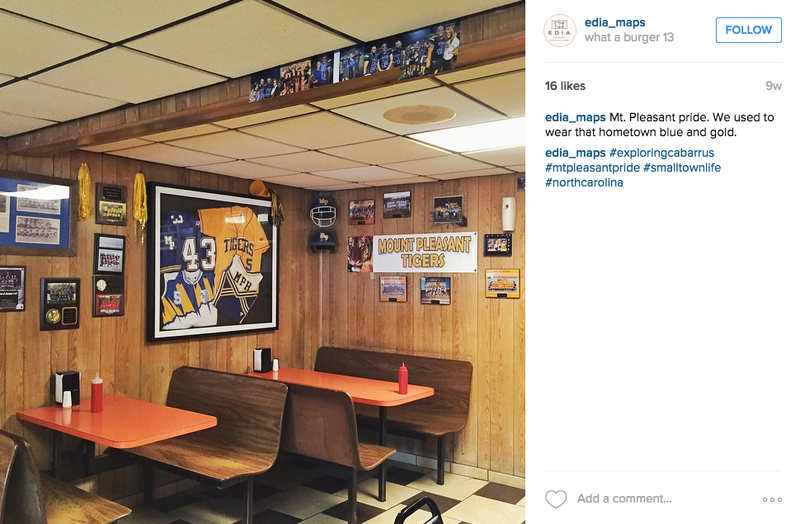 Pleasant and drive down Highway 49 past Badin Lake, there are so many great places to stop – What-a-Burger #13, Cline’s Antiques, swimming holes and rope swings along Uwharrie River, hole-in-the-wall thrift stores, more BBQ, and Badin Road Drive-In. We’re fortunate to live in such a beautiful and diverse state, so every part of NC really does have something to offer. There are always unexpected surprises along the road if you give yourself time to pay attention and uncover them. Sometimes we like to play “the yes game” — if there’s something interesting we see, we have to do it. Should we stop at that roadside stand? Yes. Should we turn around and get a picture of that cool old building. Yes. Should we turn down that dirt road to see where it leads us? Yes. No is not an option. That philosophy has helped us to truly discover North Carolina and let ourselves be led to all those small towns and unexpected experiences. 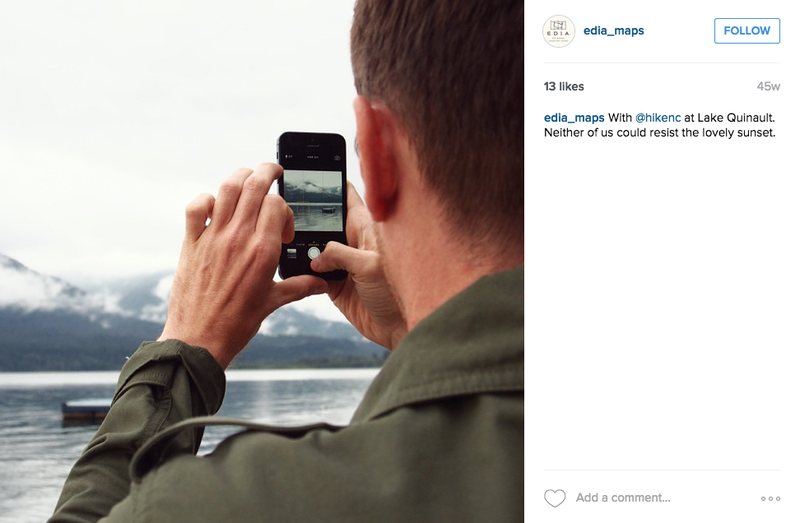 Your maps serve as a guide to your customers. What did you learn about the state of NC in producing them? 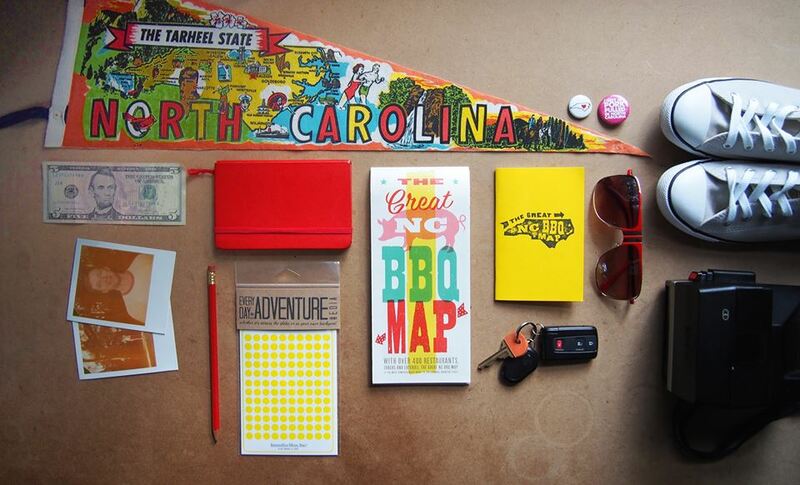 Making maps of NC has made us fall in love with our home state even more. It has taken us into the tiniest pockets of subculture, into towns so beautiful and real that are about the size of your thumbnail, and it’s got us talking to people all over the state that we’d have never come in contact with – like those great hour-long parking lot talks with someone who was a stranger 60 minutes earlier. These maps have given us a deeper appreciation for our history, our culture, even our accents – both our own and all the different regional inflections we’ve heard around the state. We’ve learned that every corner of NC has its unique beauty and story to tell and that it’s worth taking the time to listen. Why is the highest profile road in Charlotte named after someone who doesn’t seem to exist?